The Canon Professional XA30 is Canon’s top flash memory based HD camcorder. Compact in size. New for 2016-2017 is a new imager with Wide Dynamic Range, and better low light performance. Records in full 1920 x 1080 Full HD (1080p). Records to SDHC/SDXC memory cards (camcorder has two memory card slots). Relay Recording allows the camcorder to automatically switch video recording to the next available SDHC/SDXC memory card when one card is full. You can also record simultaneoulsy to both cards as a safety backup. The upgraded 20x zoom HD Video Lens delivers excellent image quality and has SuperRange optical image stabilization (to keep video sharp in low light, or when holding the camcorder without a tripod). Included lens hood. Even at 20x, it maintains a light gathering F2.8. The XA30 has a large 3.5-inch high resolution OLED touchscreen. External Microphone Terminal with Manual Audio Level Control, Headphone Terminal, New upgraded Digital DV 4 image processor. Included are advanced features such as Canon’s Native 1920 x 1080 CMOS Image Sensor (better for low light) and provides a wide dynamic range, AVCHD H.264, and has a true 24p Cinema mode. (native 24p). External Microphone Jack for better sound options. The XA30 records at up to 35mbps. At the maximum AVCHD quality , you can record about 5 hours and 55 minutes to a 64GB SDHC or SDXC memory card. More recording time is also available if you use both memory card slots. Canon’s Instant AF focusing system greatly enhances auto focus speed and accuracy and decreases the time to lock in focus (even in low light). Professional Features: include a dedicated manual focus ring for precise focusing, 8-blade Iris (which captures smooth out-of-focus ‘bokeh’ ), Edge Monitor Focus Assist System– green waveform shows overall focus of image, and Detachable Handle – to give expanded audio performance and added flexibility. Two built-in XLR audio input terminals with phantom power provide sound inputs, cold accessory shoe, external microphone holder, manual audio level controller, infrared light (to allow the capture of video in complete darkness). Without the need to add lights, the shooter may remain hidden from their subjects. Waveform monitor shows a detailed view of overall image brightness. Enhanced zebra pattern indicates “blown out” areas. Full manual exposure, including aperture priority (Av) and shutter priority (Tv) modes. White balance control, Gain control, cinema look filters. Upgraded Features from the XA30: Upgrades include, a New, Advanced HD CMOS Pro Image Sensor with Improved Low-light performance. Low-luminance noise rating of +3 dB. Wide DR gamma (600%) has been added which will expand the dynamic range over the previous XA20. This will minimize under- and over-exposure when taking video with widely varying lighting conditions, such as overexposure or blown-out highlights. Upgraded Dual-band Wi-Fi (5 GHz and 2.4 GHz) is built into the camera. New Interval Recording from 2x to 1200x (for a fast or slow motion effect). Additional Features: This model has an HDMI Mini Connector (output) for best quality when hooking this camcorder directly to an HDTV. Accessory cold shoe to add an external light or microphone. Features a large 3.5 inch OLED screen (with 1,230,000 pixels). Also included is a 0.24-inch color viewfinder (1,560,000 pixels). Remote Control Terminal (compatible with LANC protocol). Dolby Digital 2 channel (AC-3) stereo sound (Linear PCM), or 5.1-channel (with optional Canon SM-V1 microphone). Canon XA30 Dimensions: 4.3″ x 3.3″ x 7.2″ (body) (1.7 pounds w/ battery). Camcorder HD Recording Modes: 60i, 60p, PF30 Frame Rate(30p), PF24 Frame Rate (24p), Native 24p Frame Rate ( matches the frame rate of film). Smart-Review Commentary: The XA30 is Canon’s upgraded professional compact camcorder. This model has extensive upgrades from the XA30 that it replaces, with a better HD CMOS Pro sensor with Wide Dynamic Range Gamma, and better low light performance. The new dual band Built-in WiFi® technology allows you to control your camcorder remotely, or transfer video wirelessly. 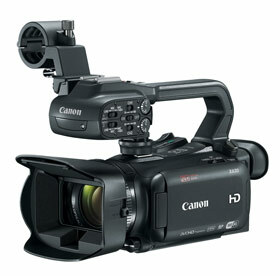 The Canon XA30 can use its dual SDHC/SDXC memory slots to record video, with the new 35mbps recording mode. The Canon XA30 has added a 60p mode (60 frames per second) to the recording options for smoother video. The lens on this camcorder offers a wider 26.8mm field of view, and has doubled the zoom range to 20x, without sacrificing light gathering (it maintains F2.8 at the long end). The lens and the Native 1920 x 1080 CMOS Image Sensor result in better video performance and dynamic range. Full HD Recording. A new feature is the large 3.5-inch OLED touchscreen high resolution screen with higher contrast and viewing angles than an LCD screen. This camcorder is loaded with all of the most important manual features including dual XLR inputs, manual focus, gain control, manual aperture and shutter, waveform, and more. Headphone Jack to monitor audio. Five assignable buttons allow you to customize this camcorder to your needs. The built-in infrared light provides night vision where you can shoot video in total darkness. The Touch & Track system on this camcorder keeps focus and exposure on any subject, no matter where it moves. Great for sports. If you need uncompressed output HD/SD-SDI port, you can get the XA35 model (available below). The Canon XA30 is a Smart-Review Top Pick for Professional Camcorders and also has won our BEST of 2017 award for Pro camcorders under $2,000.